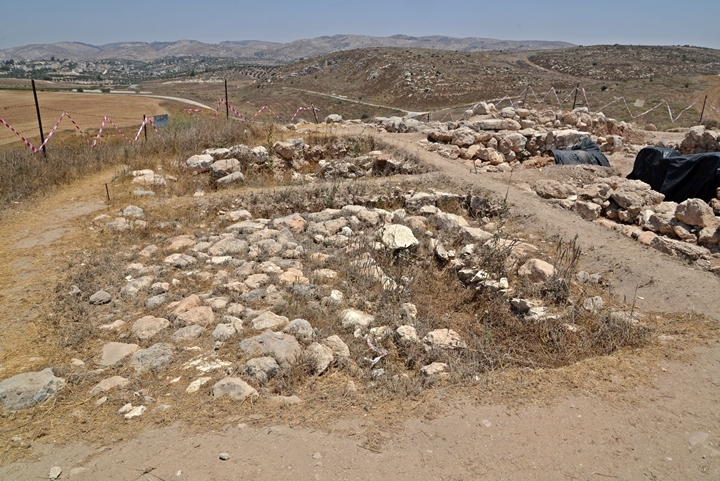 Remains of a large Biblical city, identified as Eglon, located in the Judean low hills . (Joshua 10 5): "Therefore the five kings of the Amorites... king of Eglon, gathered themselves ... and made war against it". 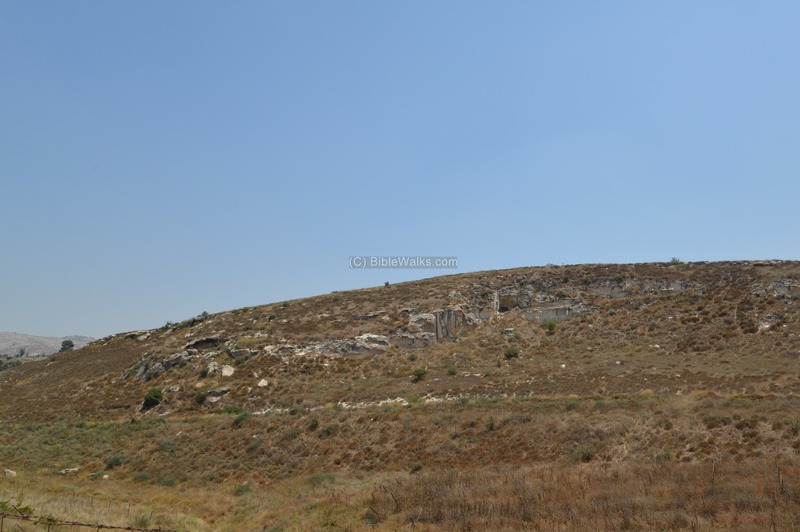 Remains of a large Biblical city located in an area where the western foothills of Hebron meet the Judean low hills. 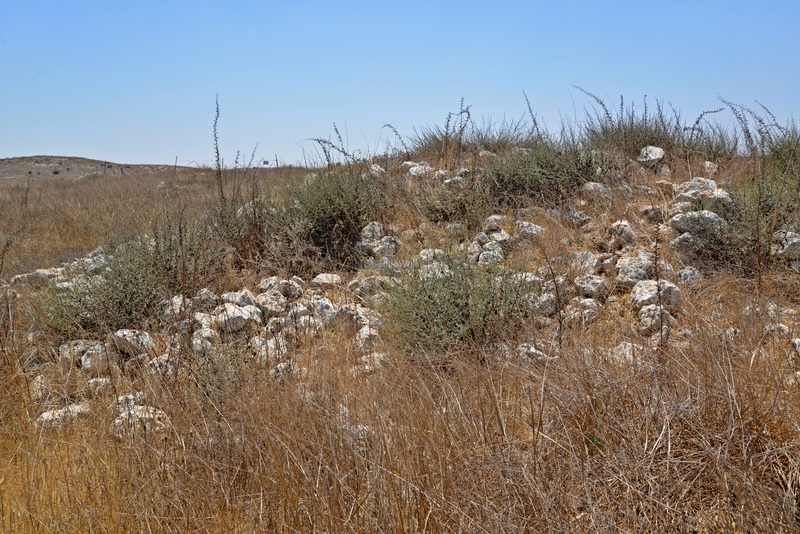 The site is identified by most scholars as Eglon, a city which fought against the Israelites as part of the 5 Amorite kings coalition. 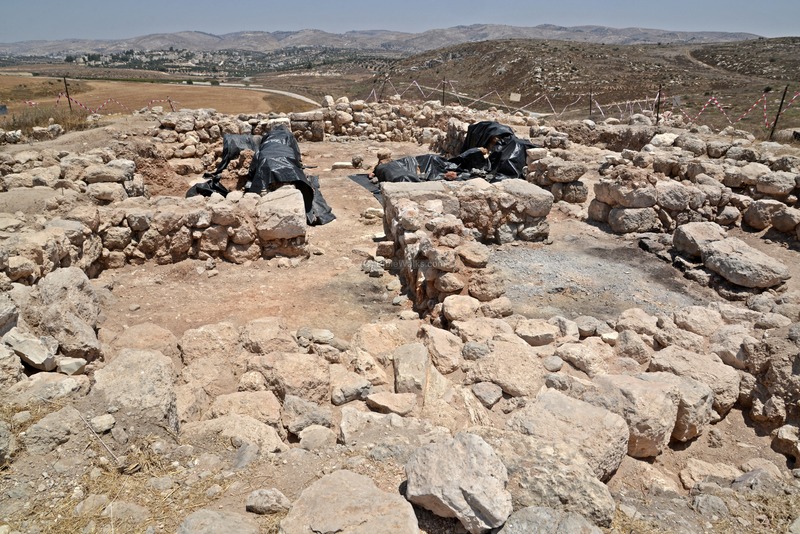 Recent excavations revealed sections of the Canaanite and Israelite city which was destroyed by the Assyrians at the end of the 8th Century BC. 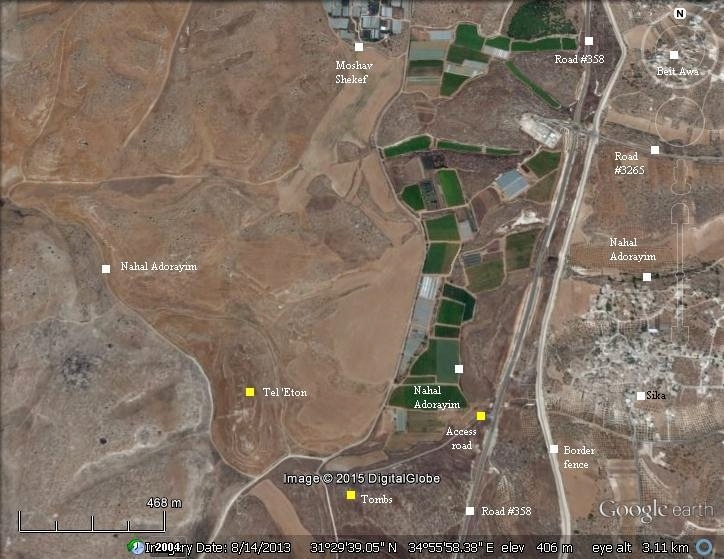 Tel 'Eton is located 2 KM south of Moshav Shekef, 2 KM north of Neta, 0.5KM west of the border road #358 (parallel to the separation fence). It can be reached by a dirt road from road #358 along Nahal Adorayim. The summit is at altitude of 400m above sea level, about 25m above the valley. This section summarizes the history of Biblical Eglon, and in later periods reviews the history of Tel 'Eton. 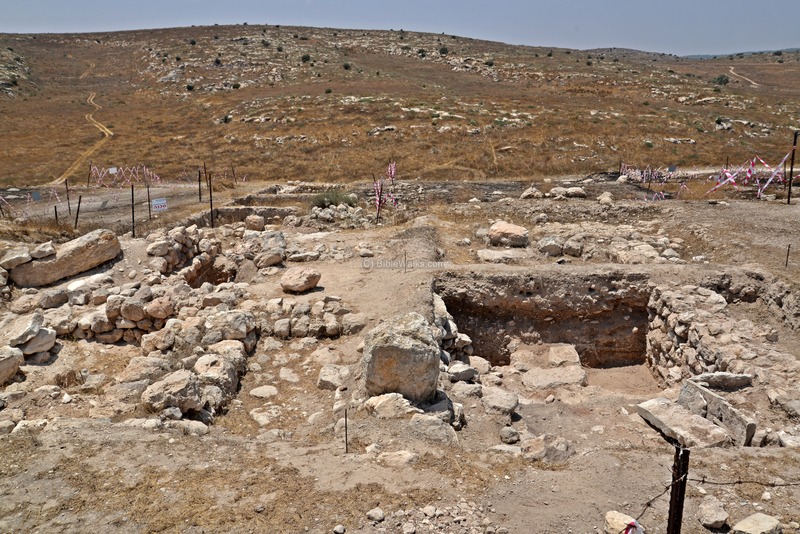 A small settlement was established on the top of the hill during the Early Bronze age (3150 - 2200 BC), which grew in size towards the end of the Early Bronze age. Eglon was one of the Canaanite cities, which fought against Joshua in the battle of the Amorite Kings coalition. The coalition attempted to block the invading Israelites after their victories in Jericho and Ai. The kings decided to punish Gibeon, a Canaanite city which signed a peace agreement with Joshua (Joshua 10 5): "Therefore the five kings of the Amorites, the king of Jerusalem, the king of Hebron, the king of Jarmuth, the king of Lachish, the king of Eglon, gathered themselves together, and went up, they and all their hosts, and encamped before Gibeon, and made war against it". "And the LORD discomfited them before Israel, and slew them with a great slaughter at Gibeon, and chased them along the way that goeth up to Bethhoron, and smote them to Azekah, and unto Makkedah. Then spake Joshua to the LORD in the day when the LORD delivered up the Amorites before the children of Israel, and he said in the sight of Israel, Sun, stand thou still upon Gibeon; and thou, Moon, in the valley of Ajalon." The Israelites were victorious (13): "And the sun stood still, and the moon stayed, until the people had avenged themselves upon their enemies.". After the Israelites conquered Canaanite cities including Lachish, they proceeded to punish Eglon (Joshua 10 34-36): "And from Lachish Joshua passed unto Eglon, and all Israel with him; and they encamped against it, and fought against it: And they took it on that day, and smote it with the edge of the sword, and all the souls that were therein he utterly destroyed that day, according to all that he had done to Lachish. And Joshua went up from Eglon, and all Israel with him, unto Hebron; and they fought against it:". The route that is described in this passage (Lachish-->Eglon-->Hebron) implies that Eglon is located in the way between Lachish and Hebron, which is one of the reasons Tel 'Eton can be Biblical Eglon. 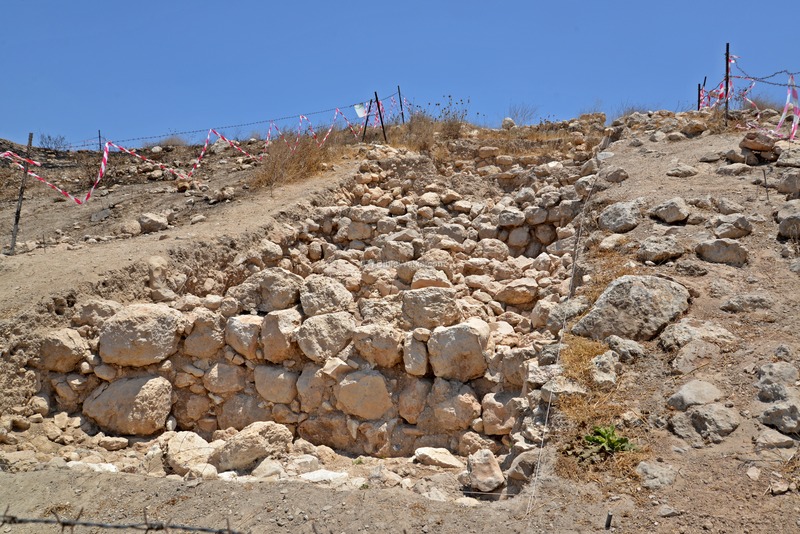 The city of Eglon is also listed as one of the conquered cities (Joshua 12 7, 12): "And these are the kings of the country which Joshua and the children of Israel smote... The king of Eglon, one; ...". Cities and roads during the Canaanite and Israelite periods are indicated on the Biblical Map below, with Eglon (marked at the location of Tel 'Eton) on the south east side of the green colored plains of Judea. Excavations on the mound identified findings of the Iron Age I, the time of the Israelite settlement. 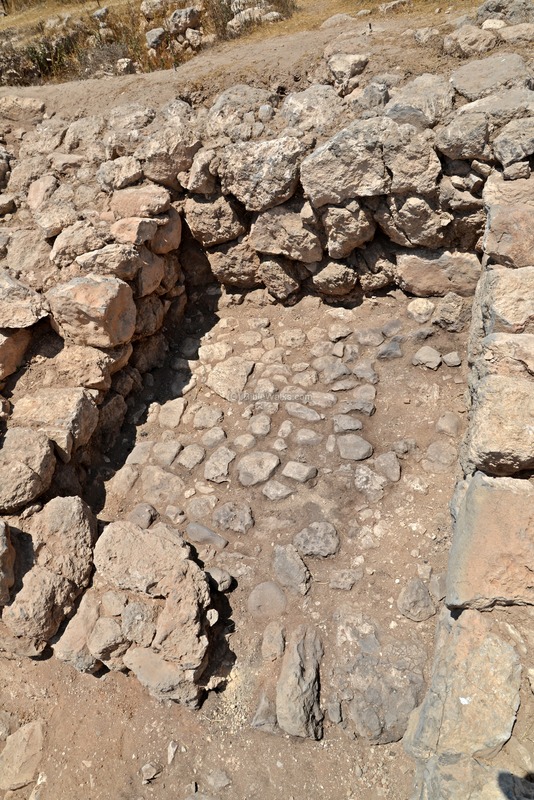 The findings included Philistine ceramics, which is unique as the Philistine presence in the eastern Shefela is rare and suggests commerce between the arch enemies. The city was an important fortified city during the times of the Judea Kingdom, defending the kingdom against the Philistine attacks on its western frontier. The excavations revealed it reached a peak in the 8th Century. "And Rehoboam dwelt in Jerusalem, and built cities for defense in Judah...And he fortified the strong holds, and put captains in them, and store of victual, and of oil and wine. And in every several city he put shields and spears, and made them exceeding strong...". The Assyrian empire, a rising force in the region, conquered the North Kingdom of Israel in 732BC, destroying most of the cities and villages in the land. The South Kingdom of Judah managed to survive this onslaught by teaming up with the Assyrians, but not for long. After the death of the Assyrian King Sargon II (722 – 705BC), King Hezekiah mutinied against the Assyrians, joining other cities in the area who attempted to free themselves from the Assyrian conquest. Anticipating the coming Assyrian intrusion, he fortified Jerusalem and the major cities. The Assyrian army came in 701 BC, lead by Sennacherib, son of Sargon II (2 Chronicles 32 1): "After these things, and the establishment thereof, Sennacherib king of Assyria came, and entered into Judah, and encamped against the fenced cities, and thought to win them for himself". According to an Assyrian clay tablet, Sennacherib (Sin-Akhi-irba - "Sin multiply the brothers") conquered 46 cities in Judea and carried off 200,150 of their inhabitants as prisoners. 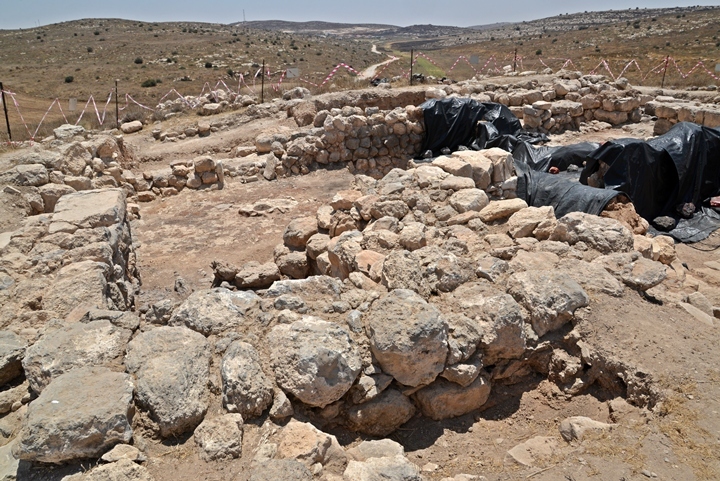 The excavations identified this conquest and destruction. A severe damage was inflicted to the structures, and many arrowheads were found in the layer of this period. 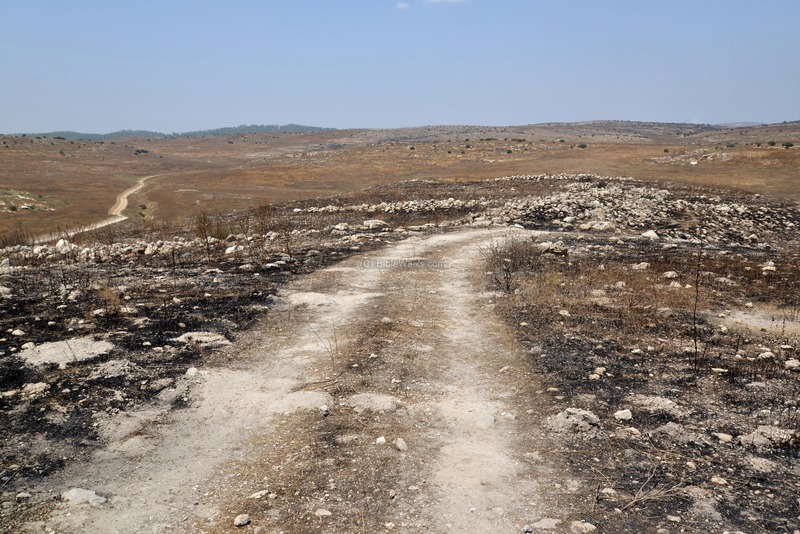 It is likely that this destruction was a result of the Sennacherib conquest. Tel 'Eton was destroyed, but Jerusalem was spared from destruction and the Assyrians retreated (2 Chronicles 31 21-22): "And the LORD sent an angel, which cut off all the mighty men of valor, and the leaders and captains in the camp of the king of Assyria. So he returned with shame of face to his own land. And when he was come into the house of his god, they that came forth of his own bowels slew him there with the sword. Thus the LORD saved Hezekiah and the inhabitants of Jerusalem from the hand of Sennacherib the king of Assyria, and from the hand of all other, and guided them on every side". The Assyrians retreated (2 Kings 19 36): "So Sennacherib king of Assyria departed, and went and returned, and dwelt at Nineveh"
According to the excavations so far, the city was not resettled during the rest of the Iron Age. The Babylonian empire rose after the fall of the Assyrians (610 BC), defeated the Egyptians (609BC) and conquered the land until the Nile (2 Kings 24 7): "... for the king of Babylon had taken from the river of Egypt unto the river Euphrates all that pertained to the king of Egypt". After 10 years under Babylonian control, Jehoiakim King of Judah mutinied, and so the Babylonians reached the gates of Jerusalem (598) and placed it under siege (2 Kings 24 10): "At that time the servants of Nebuchadnezzar king of Babylon came up against Jerusalem, and the city was besieged". Jerusalem was conquered in the summer of 587, and many of the people in the land were exiled to Babylon - thus bringing an end to the Kingdom of Judah. In 539 BC the Persians defeated the Babylonians, and allowed the exiles to return to Zion (538 through 445 BC). The cities were reconstructed (Nehemiah 11 1, 30): "And the rulers of the people dwelt at Jerusalem: the rest of the people also cast lots, to bring one of ten to dwell in Jerusalem the holy city, and nine parts to dwell in other cities.... Zanoah, Adullam, and in their villages, at Lachish, and the fields thereof, at Azekah, and in the villages thereof. ". The excavations identified a small settlement during the Persian period. Perhaps, the massive fortress on the high east side of the mound was constructed at this time. Following the end of the Persian period the city status started to decay, resulting by a complete abandonment during the Hellenistic period. This was a common pattern of most of these ancient Tells. The new settlement moved to the nearby hills on the west side of the site - ruined Roman-Byzantine villages such as 'Aitun et Tachta ('Lower Eton), and Khirbet Umm a-Sheqaf. During the Byzantine period the summit of the mound was plowed for farming, and terraces were built along the foothills. Remains of Byzantine pottery were found in Area B. A section of maps 20 and 21 appear on the right, with Tel 'Eton (Kh. 'Aitun) in the center. It is situated on a mound south of Wady el Akra, a continuation of Wady el Jizair (Arabic for the valley of the Islands). 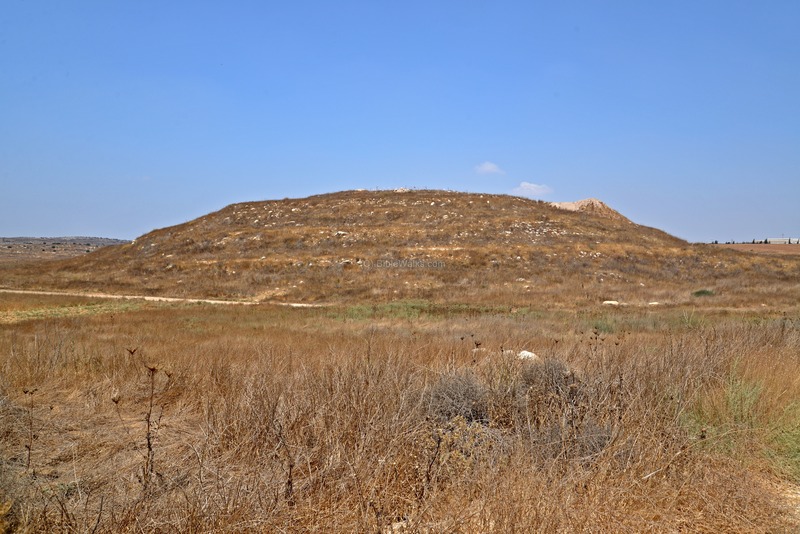 "Khirbet 'Aitun - A mound with foundations. A square cell is cut in the rock opposite the ruin on the south". "Eglon (Joshua xv.39), in the plain of Judah, would appear to be the ruin of 'Ajlan. In the 'Onomasticon' (s.v. 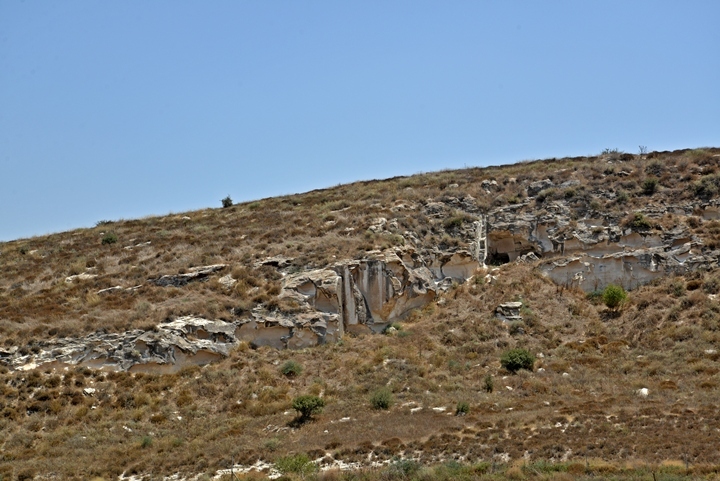 Bethagla) this place is mentioned as a village (vicus) on the road to Gaza, 10 Roman miles from Eleutheropolis (Beit Jibrin), but is not identified with Eglon, which was confused by Eusebius with Adullam. 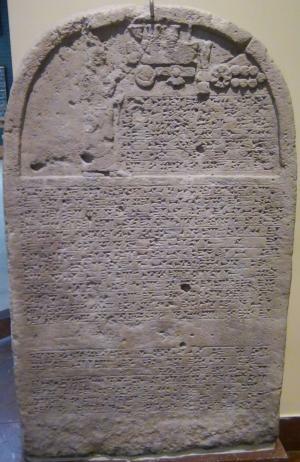 'Ajlan is 10 English miles from Beit Jibrin (Eleutheropolis)". 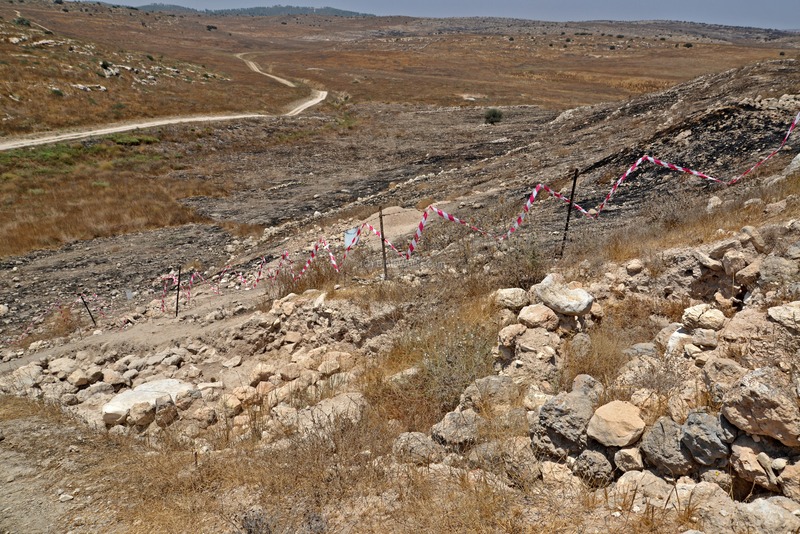 Indeed, Tel Eton is 9 Roman miles south of Beit Jibrin, so it is a good fit to the Onomasticon. Ancient roads are marked on its south and north sides, which connected to Hebron on the east side (16KM away), and Lachish on the west side. 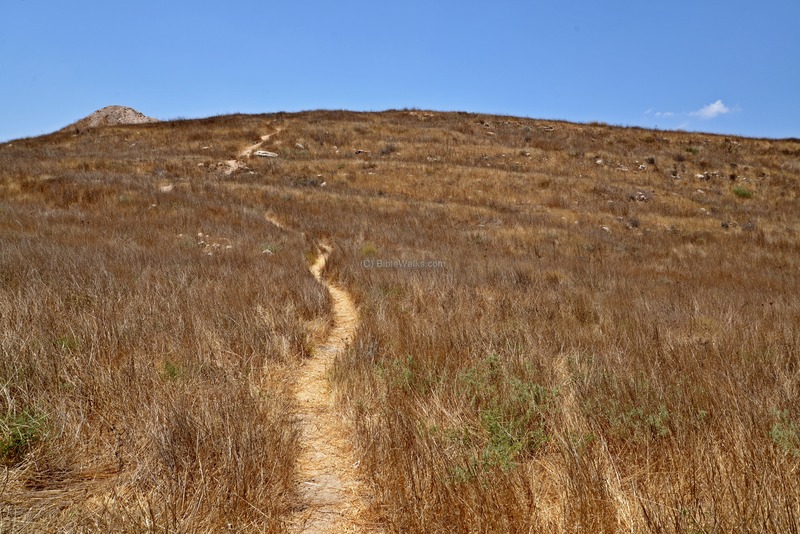 It is also 7 miles (11km) south east of Lachish. 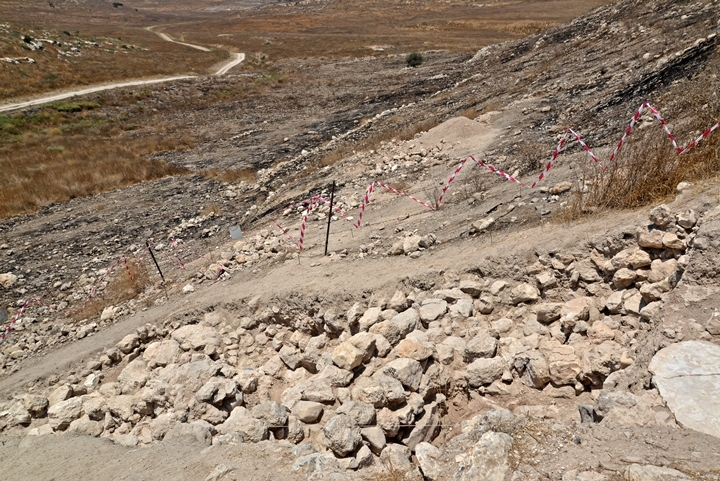 The ancient road to Lachish passed near Tel 'Eton, going north west thru Wadi Ghufer (Nahal Lachish). 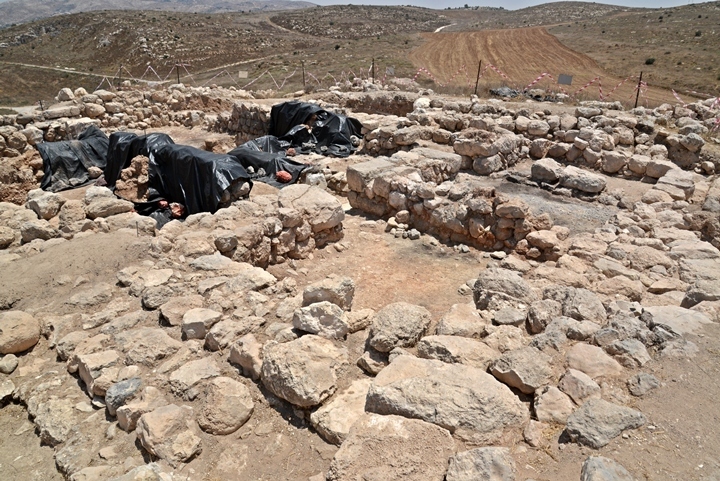 A first salvage excavation was conducted in the 1970s by the Tel-Aviv university team of the Lachish expedition, directed by D. Ussishkin. 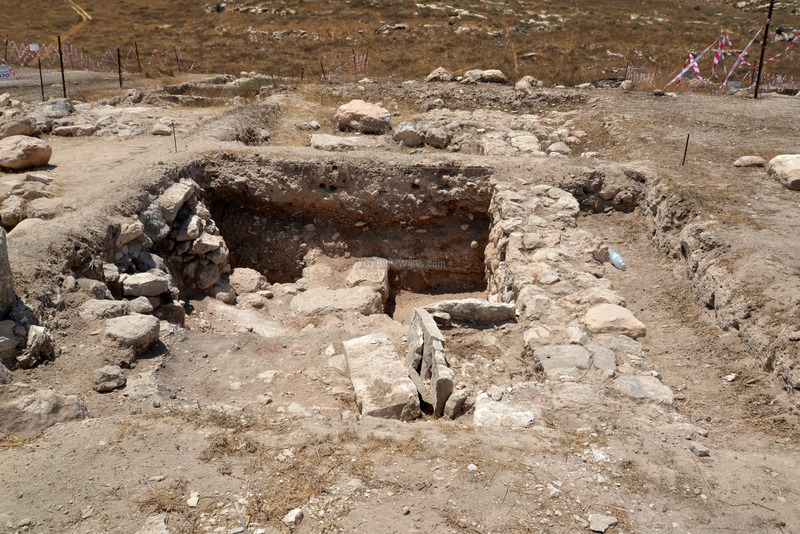 This team, headed by Ethan Ayalon, opened four shallow squares on the summit (part of "Area B"), and identified two levels dated to the Israelite Kingdom. Starting in 2006, large scale excavations were conducted by a team of Bar-Ilan University, directed by Prof. Avraham Faust and co-directed by Haya Katz, and other experts in Biblical Archaeology. The team excavated "Area A" on the south east side of the summit, enlarged "Area B", and added a small "Area C" on the north eastern side and "Area D" on the south western side of the mound. The area of the site was also divided to 39 subunits, and the team examined each one of the subunits with a small (1m x 1m x 0.2m) survey dig. The ceramics analysis of the subunits work was that 90% of the findings were dated to the Iron Age II, suggesting that the site was an important city during the Israelite Kingdom period. Based on the findings, the size of the city and its location, the archaeologists have good indications that this was Biblical Eglon. Future seasons may provide more clues to the identity of Tel 'Eton. A drone captured this view from the south east side on end of July 2015, after another season of excavations. Tel 'Eton is oriented on a north-south axis, with the highest point on the south side. The mound rises above the valley on all sides, covering a large area of approximately 60 dunams (6 hectares). Another aerial view of the south-east side of the mound is in the next photo. An excavation "Area A" was cut into the southern edge of the summit, where traces of a large structure was visible before the excavations. We arrived to the site from the south east side. 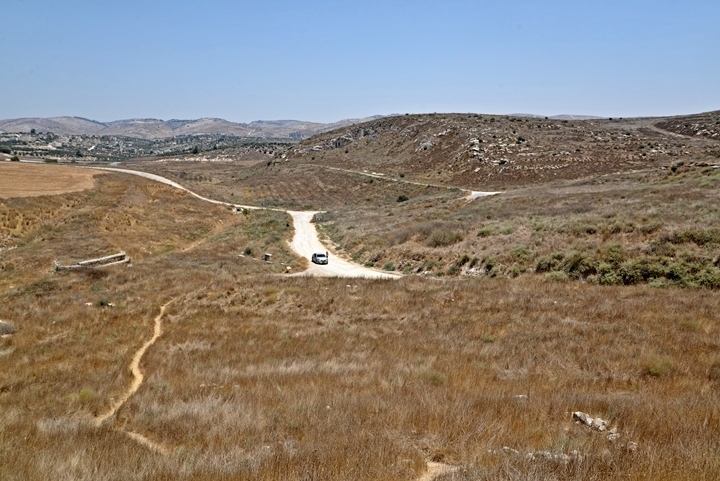 Road #358, the Israeli border road going south from Moshav Amatzia, passes close to the site. A good dirt road then provides an easy access to the foothills. Nahal Adorayim stream is seen on the left (north) side, with a dam built over it to regulate the flow of flash floods. 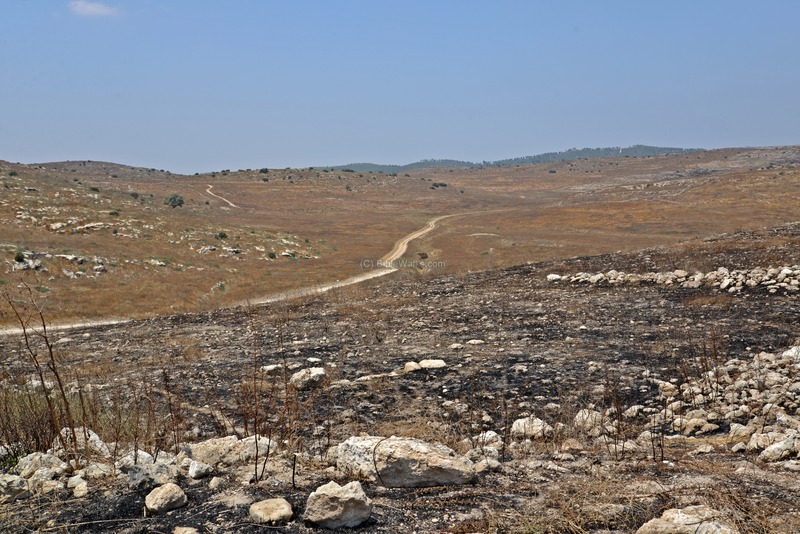 The hills of Hebron are seen in the far background. The next photo is a view from the west side of the mound. On this point is a large well that once supplied water to the city. An ascent path up to the summit is seen in the next photo. The pile of soil on the left side is evident of the archaeological excavations on the southern side of the summit. On the summit are traces of ruins, with uncut field stones that are typical of Bronze and Iron age structures. The archaeologists opened so far few limited squares in order to reveal the secrets of the city, date the time of its structures, and hopefully identify the city. One of these areas is "Area A", on the south side of the mound. A closer view of the area is shown next. 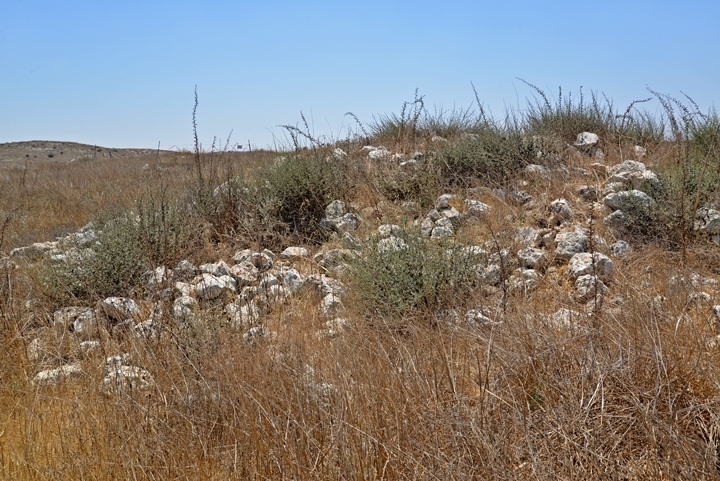 Three ancient layers were identified here - Late Persian and two layers of the Iron Age II . The uppermost layer includes remains of a massive square structure, with estimated size of 20m x 20m. The walls are about 3.05m wide, constructed of two external walls made of larger stones, with smaller stones filling between them. Inside the structure were several dividing walls. The strength of the wall implies that it was a base of a fortress that overlooked the area. Only the base of the fortress survived. The archaeologists dated it to the late Persian period or the early Hellenistic period. Another layer above the massive tower may suggest that the site was resettled shortly after the destruction. In this photo is a section of that wall. Other parts of this wall were peeled off, in order to dig into the lower (earlier) layer underneath it. Beneath the two layers, a lower layer was the most preserved and substantial. It is dated to the 8th Century BC. 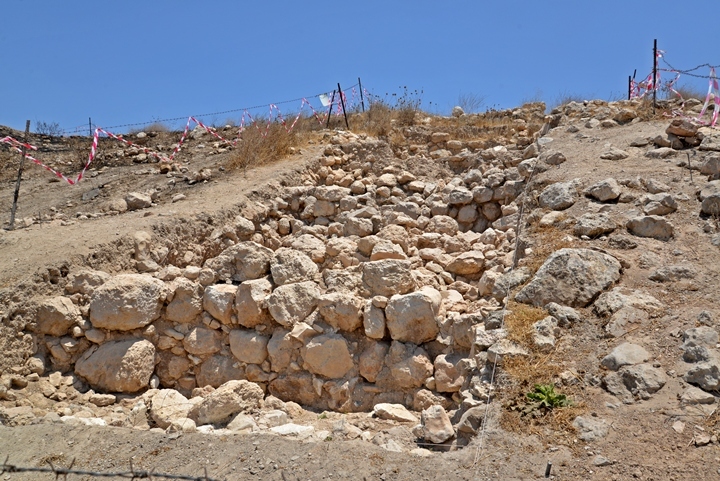 The structures suffered a violent destruction, and was probably destroyed by Sennacherib in 701BC (2 Chronicles 31 1): "... Sennacherib king of Assyria came, and entered into Judah, and encamped against the fenced cities, and thought to win them for himself". Many arrow heads were found in this destruction layer, attesting to the fierce onslaught. Some of the walls in this layer were preserved to a height of 1.5m. According to the findings and the quality of construction, this was a residential house of a rich family. It may have initially been built as a public house, then changed to private owners. The house had two stories and covered an area of 180 square meter. The house included a central unroofed courtyard, and several roofed rooms around it. The floor of the courtyard was plastered. Rooms around the central courtyard were paved, as seen below. Many smashed storage vessels were found in situ in the ground level storerooms. 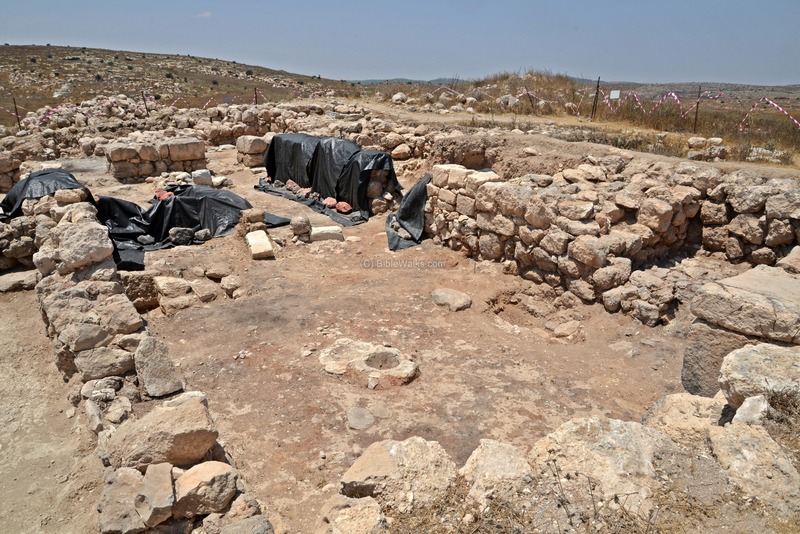 The content of the storage vessels included seeds of olives, grapes, lentil and grains. The excavators also unearthed smaller pottery vessels, loom weights, metal vessels and bullae seals. A second floor was built above the rooms around the central courtyard. The upper floors had many vessels and cooking pots. 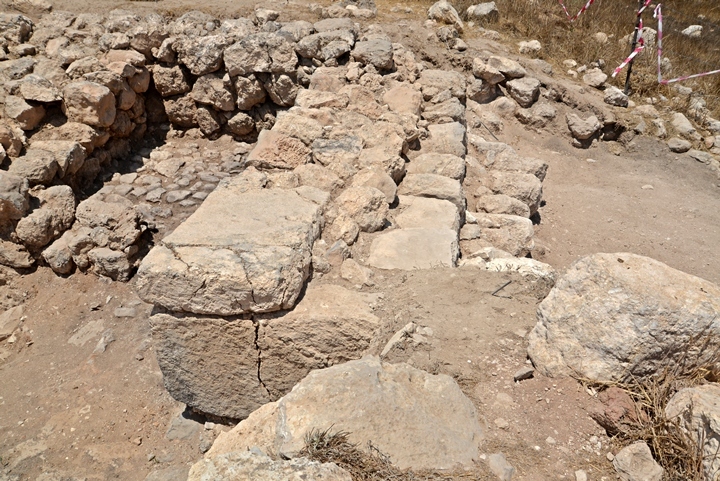 Other buildings of the same layer have been unearthed around the central structure. A number of excavation squares were opened in Area B, 120m north of Area A, extending the line of excavations of the 1970s to the lower (south) terraces. This photo shows extended area is located on the western side of the mound. The squares were cut into the edge and foothills of the mound. On the upper layer of 50 cm the excavators found a "sterile" layer composed of soil, fieldstones and fragments of ceramics, but no structures. The ceramics were dated to the Iron Age II and the Byzantine period. The archaeologists concluded that this upper layer may have been the result of the farming activities during the Byzantine period. Under the "sterile" layer, medium and large sized stones were found, also belonging to the Byzantine terraces. However, underneath that layer they found ceramics and foundations of walls and rooms that are dated to the Iron Age I (on the eastern side of the cut), and remains of the Persian period (on the western side of the cut). Among the Iron Age I ceramics were Philistine pottery with two colors. Another section of Area B was also cut on the upper portion of the mound, east of the lower squares. These new excavation squares were added around the original squares excavated by the 1970s team. This aerial view shows the area of the excavation, which is in the center of the mound, 120m north of Area A. A closer view of Area B is below. Several structures were found in these new squares opened around the area of the 1970s excavation. The excavations revealed impressive remains from the Iron Age II - the late 8th Century BC. They were found directly under the surface. These findings attest to a violent destruction, as seen in the lower layer of Area A. Many of the floors in the structures that were unearthed here were made of plaster, and are well preserved. The north sides of the mound are mostly not yet excavated. The excavation team opened a small area 'C' on a lower area on the north eastern side. Future seasons will explore other areas of the site. The north western foothills are seen in the next photo. 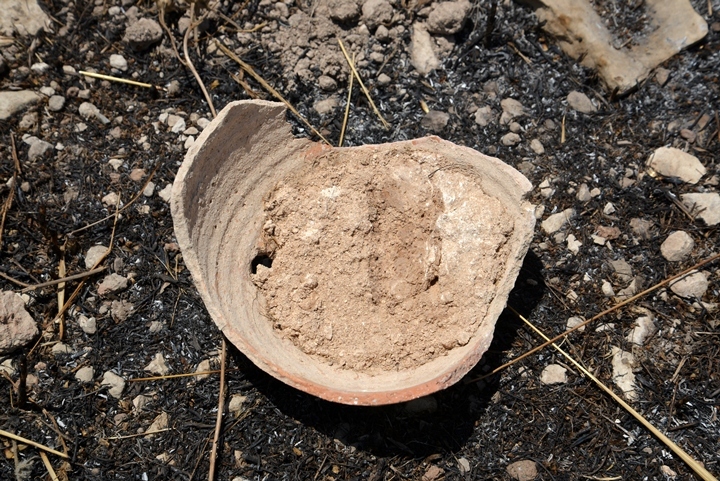 A fire cleaned the dry weed, making it more easier to see the traces of the ruins across the site. On the south west side, 50m north west of Area A, is another excavation - Area D.
Around the site is a large necropolis, consisting of hundreds (perhaps, thousands) of ancient burial places. The graves in this vast cemetery started in the end of the third millennium, with shaft graves typical of the Middle Bronze period. Unfortunately, most of the tombs were robbed before the archaeologists could scientifically research the findings. 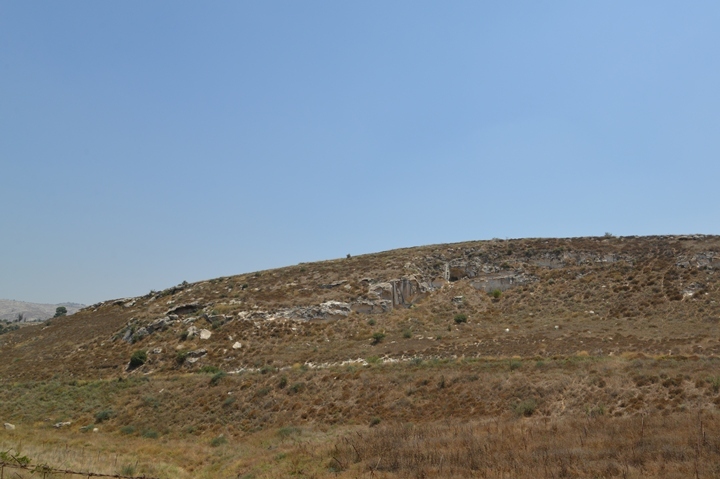 This hill is on the east side of Tel 'Eton. The graves around the mound were also dated to the Late Bronze age, Iron Age I and II, and some later graves. A closer view of the eastern hill is in the following photo. Eglon, 'Eglon - Biblical city, Hebrew for driver of a cart. This may also be a Canaanite source with a different meaning, or perhaps the Auriga star constillation. It was a common name, such as Eglon king of Moab (Judges 3). 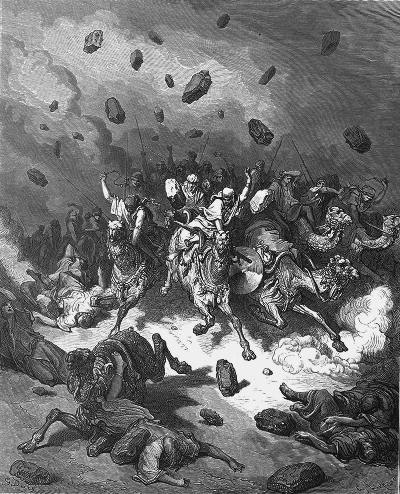 Biblical reference (one of many): (Joshua 10 5): "Therefore the five kings of the Amorites... king of Eglon, gathered themselves ... and made war against it"